Now that the colder weather is settling in, it is time to for more hearty and comforting kind of food. Lentils can go many ways! When I cook some, I usually make extra and enjoy them all week long! 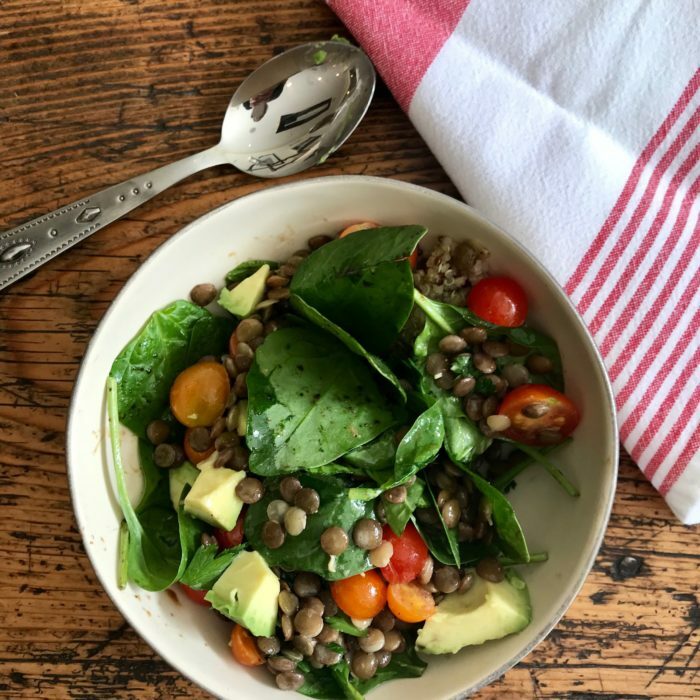 Here is a super easy and delicious lentil salad that will pair perfectly with quinoa, spinach, sweet potato or even on its own! Cook the lentils according to packaging instructions. Meanwhile make the dressing by mixing the ingredients together. Chop the tomatoes and the herbs. When the lentils are cooked, drain and mix in the dressing while still warm, add the tomatoes the herbs and sprinkle some salt and pepper. In the picture, I added some quinoa, spinach and avocado which made the most delicious lunch!!! So easy to make and so good.. I could have it everyday !